Summer is here and it's a great time to get outdoors. Unfortunately, the South Bay can be unbearably hot and I admit to often wanting to retreat inside to air-conditioning. The summer months are a good time to plan a getaway to somewhere cool. No matter what type of traveler you are, here are five different places that you can go to beat the heat and enjoy the great outdoors this summer season. Some are close to home and suitable for day trips, and others are best for weekend or extended getaways. Click through these slides for five Northern California and Oregon summer itineraries with tips for where to stay and things to do. Can't get away? Check out this list of Silicon Valley summer festivals and events, local hiking trails, local campgrounds, and this list of places to go swimming this summer. Have a Silicon Valley travel question or local story idea? Send me an email or connect on Facebook, Twitter, or Pinterest! Heading over the hill to Santa Cruz is a great way to get away from the Silicon Valley summer heat and enjoy breezy coastal temps. The Santa Cruz Wharf and the Santa Cruz Beach Boardwalk are popular first stops for a family-friendly outing. When you are in the area, be sure to check out the new Monterey Bay National Marine Sanctuary Exploration Center (35 Pacific Avenue, Santa Cruz) for state-of-the-art exhibits and kid-friendly interactive displays on the Monterey Bay ecosystem and conservation. Admission is free. For a family beach day, consider visiting the charming and colorful town of Capitola, the oldest seaside resort town on the Pacific Coast -- the Capitola Wharf that dates back to 1857. Capitola Beach is easy to get to and sheltered from the wind so its warmer than some of the other area beaches. It also has beginner-friendly waves and, thanks to the Capitola Beach Company, you can rent surfboards, stand-up paddleboards, and body boards from a stand on the beach. The coastal Santa Cruz area is home to lots of farms, including several that you can visit for a family-friendly foodie outing. Go strawberry picking at Gizdich Ranch (55 Peckham Rd., Watsonville) or Swanton Berry Farm (25 Swanton Road, Davenport). Consider a stop at Glaum Egg Ranch (3100 Valencia Rd, Aptos) for some quirky fun via their mechanical (and musical!) "egg vending machine." Yes, Santa Cruz is close, but if you want to spend some dedicated time at the beach (arriving early to beat the crowds and staying late for barbecues and bonfires), you're better off spending the night. One good option for family travelers is the Santa Cruz / Monterey Bay KOA (1186 San Andreas Rd., Watsonville). This award-winning KOA property has a camping option for every budget, from tent sites and rustic cabins to luxe, fully-furnished cabins (called "lodges") with plush queen sized beds, living rooms with pull-out leather couches and wall-mounted flat screen TVs, a fully stocked kitchens (with refrigerators and Keurig machines), and a private bathrooms. The complex has a year-round heated pool and jacuzzi, mini golf, a Big Bouncer inflatable trampoline, climbing walls shaped like palm trees, a kiddie fun train, a dog park, and a pet bath. Read reviews of Santa Cruz / Monterey Bay KOA on TripAdvisor. When you want to cool off in the summer, San Francisco is a reliable bet. Local tour company Dylan's Tours (782 Columbus Ave.) has an interesting and high-tech alternative to traditional day tours -- explore the city on an electric bike. All of their small-group San Francisco bike tours include a Pedego Electric Bike, which makes climbing San Francisco's famous hills a piece of cake. City Loop Tour: An all-day (6 hour) bike ride through several scenic neighborhoods and past many of the city's top sights. An Intro to SF Tour: A 90-minute tour of some of the city's top sights and then an all-day bike rental to explore the city at your leisure. Alternatively, bike over the Golden Gate Bridge to Sausalito and take the ferry back. Bike + Picnic Tour: An all-day bike rental plus a gourmet picnic lunch for two with artisanal charcuterie, fresh baked baguette, seasonal fruit, salads, and chocolate truffles, picnic blanket and more. Electric bikes give you the freedom to see more of the city than you would get to explore by foot or by car and not be hampered by the city's famous hills. I got the chance to try out one of these e-bikes recently on the Dylan's Tour City Loop Tour and was impressed by how easy they are to ride. As a long-time Bay Area resident, I wasn't sure I'd see anything new but the electric bike made lots of never before seen corners of San Francisco within easy reach. Looking to try out an e-bike in other California cities? Pedego offers electric bike rentals at all of their California stores (Los Angeles, San Diego, Sacramento, Redding, the Central Coast, and more). Read reviews of Dylan's Tours on TripAdvisor. Don't bother--make it a day trip. San Francisco hotels are notoriously expensive in the summer so just come up for the day. If you want to stay the night, look for a place in nearby North Beach, Fisherman's Wharf, or the Embarcadero. Hiking, mountain biking, fly fishing, and water sports are just a few of the outdoor adventures that you can have in and around Truckee and the north shore communities of Lake Tahoe. 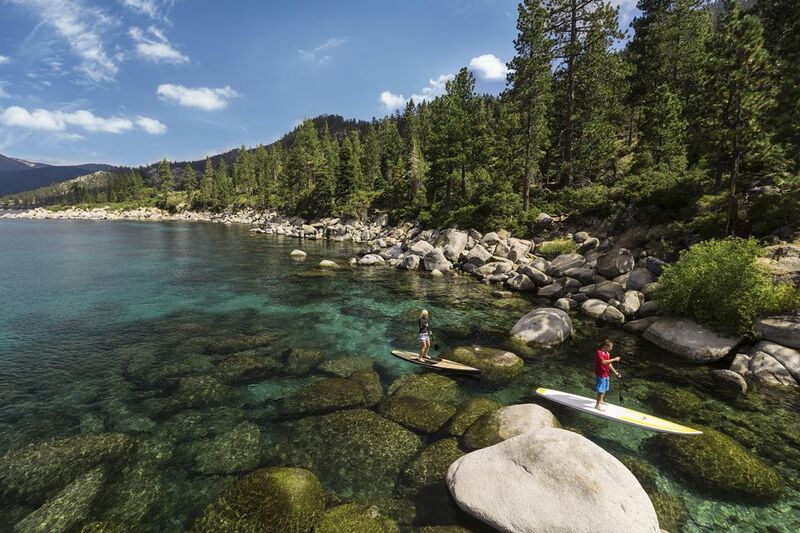 To get out on the crystal clear lake, book a stand-up paddleboard (SUP) or kayak tour with Tahoe Adventure Company (7010 North Lake Blvd, Tahoe Vist, CA). If you just want to rent gear, they have a daily rental kiosk on the public beach at the Tahoe Vista Recreation Area. The Eastern Sierra region has some of the darkest night skies on earth. For a guided tour of the solar system (complete with blankets and hand-warming cups of hot chocolate and Starbucks coffee), check out Tahoe Star Tours, an introductory astronomy workshop and guided star tour offered every Thursday, Friday, and Saturday through the summer months. This father-son duo teaches you about the night sky aided by three powerful Celestron telescopes. Check into the Ritz-Carlton, Lake Tahoe (13031 Ritz-Carlton Highlands Ct., Truckee) for some luxury near the lake. This mountainside resort offers access to a full range of the Tahoe region's outdoor activities with the comfort of a five-star luxury resort. The main hotel pool offers bar service and private cabanas available for the day. For those who want to relax, the hotel offers unlimited guest access to the luxe spa facilities and private adults-only spa swimming pool. The property just broke ground on a new lake house (the Lake Club) that will be bringing Lake Tahoe beach access to resort guests in the summer of 2017. The modern neighborhood-scale property, designed by local architect, Clare Walton, will have a multi-level dining and bar facility with panoramic views of the lake, private beach access, on-site watersports gear rental, and a private boat pier. Read reviews of the Ritz-Carlton, Lake Tahoe on TripAdvisor. Northern California's coastal Humboldt County stays cool much of the year and is full of outdoor activities that be had for cheap. Hiking is a given as this area is home to the largest old-growth redwood forest in the world and some of the tallest trees on earth. Don't miss doing a drive down the Highway 101 stretch famously called the "Avenue of the Giants." The Founder's Grove trail passes through some of the largest and the oldest trees in the forest including the massive felled Dyerville Giant. When this tree fell in 1991, it sounded like a train wreck--it could be heard for miles around. Check out some rugged coastal views and the quirky North Coast towns of Eureka and Arcata. The Saturday Arcata Plaza farmer's market is full of quirky vendors and it's a great place to stock up on good food for cheap. Outdoor lovers on a budget should take advantage Humboldt County's stunning state park campgrounds, especially those adjacent to the Avenue of the Giants. The campgrounds in Humboldt Redwoods State Park are a great choice, letting you fall asleep to the sound of some of the tallest trees on earth swaying overhead. Read reviews of Humboldt Redwoods State Park on TripAdvisor. Klamath Falls, Oregon is right over the California border but the region's many outdoor adventures span both states. Watersports, hiking, biking, fishing, birding, and ziplining, are popular local activities. The crowning jewel of Southern Oregon and the Southern Cascade Mountains is Crater Lake National Park. The weather at this high-altitude spot is famously snowy so the summer is the only time you can guarantee you'll be able to get up the mountain to see the deep blue volcanic lake. Just past Crater Lake, you can hike to dozens of Southern Oregon waterfalls by driving Highway 138, "the Highway of Waterfalls." Crossing over into California, Lava Beds National Monument offers a unique way to cool off--in the deep and dark depths of more than a dozen underground lava tubes. Bring a powerful flashlight to guide the way. The Running Y Ranch (5500 Running Y Road, Klamath Falls, OR) is a great place to stay for nature lovers. This 82 room lodge and conference center has 3,600 acres of forest bordering Klamath Lake. The property includes 12 miles of hiking, biking, and birding trails and Oregon’s only Arnold Palmer-designed golf course. Read reviews of Running Y Ranch Resort on TripAdvisor.